Oliver stands out as a fast-rising favorite for boys, and the new member of the US Top Ten. From Charles Dickens to The Brady Bunch to a playground near you, this name blends the literary, the quirky, and the oh-so-popular, too. Like many a medieval name, this one claims Germanic roots. It likely comes from Alfher or Alfihar, meaning elf army. Or maybe it’s cousin to Alvar, elf warrior. Why were parents keen to name their children after elves? I can’t say, but it appears they were considered supernatural creatures with great beauty, capable of helping or harming mankind. We’ve transformed them in legend and pop culture since, giving rise to the jingle-bell wearing elves of Santa’s workshop, as well as the fierce soldiers we meet in Tolkien’s novels. Olive branches have long symbolized peace. The Latin oliverus influenced the spelling of fierce Alfher. Or maybe two separate names merged into one. The French word for an olive tree is Olivier; that’s also the French form of the given name. Back in the 1100s, Olivier was friend and advisor to Roland in the famous French poem, best known as The Song of Roland. Cautious and wise Olivier serves as the foil for the daring – and sometimes reckless – hero, Roland. The Normans brought the name to England, and while Oliver never reached the same heights of popularity as William or John, the name became reasonably familiar. If you know your history – or just your Elvis Costello songs – Oliver Cromwell comes to mind. Cromwell led the overthrow of the monarchy in England – at least for a little while. He died in 1658 of natural causes, and by 1660, Charles II – son of monarch Cromwell dethroned – had returned to England as king. Cromwell’s body was exhumed and he was posthumously executed. It’s not clear if the name fell in use along with Cromwell. It simply hadn’t been terribly common in the first place. Fast forward to 1838. Charles Dickens’ novels come with rich social commentary. Orphans suffered, leading bleak lives in workhouses in nineteenth century England. Dickens would become a tireless campaigner for social reform, as well as a literary giant of the Victorian era and beyond. Twist tells of a child born into poverty, his mother dead and father unknown. He spends time at a workhouse and as an apprentice, almost always hungry and ill-treated. After he escapes to London, he’s caught up in a life of petty crime. It’s bleak. And yet, most of us know the story differently. That’s because the novel is oft-adapted. In 1960, the book became a cheerful, upbeat musical titled simply Oliver! The musical inspired a 1968 movie adaptation, which won the Academy Award for Best Picture, along with nearly a half-dozen more. Feel free to hum along to “Consider Yourself” as you read on. Erich Segal’s novel Love Story debuted in 1970, and became a runaway bestseller and then a smash hit movie starring a young Ryan O’Neal. O’Neal played Oliver Barrett IV, privileged and preppy and enrolled at Harvard like all of the men in his family before him. He falls for Ali McGraw as Jenny, whipsmart and street-smart, attending Radcliffe on a scholarship. Despite his family’s disapproval and all the conflict their different backgrounds bring, they marry. And then comes tragedy. It’s richly romantic and still widely read and watched. What did all of this mean for the name’s use in the US? In the late nineteenth century, Oliver regularly appeared in the US Top 100. Poet Oliver Wendell Homes, Sr. was born in 1809, and his son and future Supreme Court justice in 1840. Comedian Hardy followed in 1892, along with plenty of other notables. The name faded in the twentieth century, nevermind the musical sensation. But Love Story? That changed things. For the first time in decades, Oliver climbed, rising from the 400s into the 300s. Instead, during the 1970s and 80s the name read differently. We recognized it as traditional, but also found it quirky and offbeat. The smash hit television series debuted in 1969. As the six Brady kids reached young adulthood, the show introduced a new kid – Cousin Oliver, Carol’s nephew whose parents were living abroad. Not only did the new cast member fail to save the show – it was cancelled the same year – but it gave rise to the term “Cousin Oliver Syndrome,” used to describe the addition of a new baby to any long-running series. Played by Robbie Rist, the character is meant to be darling and adorable, introducing all sorts of hilarious complications to the existing bunch of Bradys. He’s small and bespectacled and undeniably cute, but long-time fans of the show also saw him as an unwelcome distraction. If the other Brady kids had names that felt like mainstream favorites – Gregory, Peter, and Robert were solid, Top 100 choices in the era – Oliver was an outsider, in every sense of the word. Of course, this name exists as a surname as well as a given name. You might think of jazz great King, celebrity chef Jamie, television personality John, or a dozen athletes, actors, and other notables. And while it wasn’t wildly popular during most of the twentieth century, we can think of famous figures galore: filmmaker Stone, actor Platt – who played an Oliver on The West Wing in the 90s, and more. We’re wild for Olivia, a Top Ten girls’ name for nearly twenty years. So it’s no surprise to see Oliver rise, too. 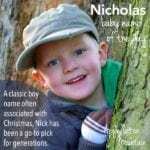 But it’s been among the fastest-rising boy names of recent years, entering the Top 100 in 2009 and galloping into the Top Ten last year. With history galore, this name feels traditional, but not quite mainstream. It fits so many trends: the ‘v’ sound; the letter O; and there’s even a small-screen tie-in, thanks to superhero series Arrow. That’s really the name’s only drawback: that it’s so on-trend that plenty of parents have discovered Oliver already. Are you hearing more of this name in your neighborhood? First published on November 30, 2008, this post was revised substantially and re-posted on April 14, 2014, and again on May 23, 2018. Oliver’s been the #1 boy’s name here in Australia for years now. 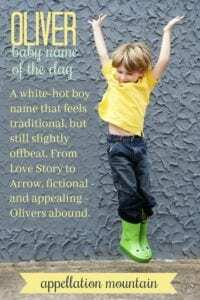 It’s a lovely name – it reminds me of choices such as Arthur, Oscar and Finn: soft but strong names of mythological heroes that feel at home on a 21st-century boy. Oliver entered the top 20 in my home province of British Columbia in 2011, and has been there ever since. It hit number one in 2015. It was my favourite boy’s name for a long time, but by the time I was actually pregnant with our first (a boy) I knew two little Olivers and wanted something different for our baby. So we have an Arthur! The three young Olivers I know are 4, 3, and 1 year old. I still really like the name, despite it’s popularity! There is an Oliver in my neighborhood here in California, and he has a sister named Freya. 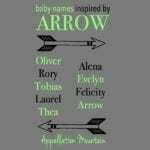 To me, Oliver and Freya make a charming british-sounding sibling set. We almost had an Oliver. I liked it after checking the UK name charts where it was top 10, yet it wasn’t as popular in the US in 2007. We were looking at the 2006 stats when he was at #173. He sure jumped up the charts! It came down to my husband choosing between my two favourites: Henry & Oliver, after our son was born. He wasn’t as keen on Oliver – something about how someone’s Dad had that name, when he was a kid. And the Dad was fat and the “O” at the beginning of the name made him think of the overweight father or something! Our son is actually really skinny, like his Dad, so we could have got away with the “fat O” name. I do like O names. I remember spotting a few young Olivers around town – they seem to be brothers of Henrys. We went the French route and chose to name our third son Olivier (oh-live-yay). Nickname is Olie (oh-lee). So there is that less popular option, too. (Other sons are Mateo and Andreas). Oooh … Mateo, Andrea, and Olivier – I’m in love! What handsome names. Mateo, Andreas, and Olivier got a baby sister named Rosalie in 2012. And a man named “Olive”. Oliver’s one of my kid brother’s middles. We used to tease him (when we were all much younger) O, liver! Drove him so nuts he flipped his middles when he turned 18. I still tell him he should have changed the spelling of Steven too but I digress. Oliver gets high marks from me, he’s stalwart, solid and just the teensiest bit lighthearted. I do like him. Quite a bit. Not too crazy about Oliver or Ollie (sound better with a British accent, I think). Do like Olivia, though..but not Olive. Aw, I love Oliver. He’s so cute. I’d have considered him if my last name didn’t end in -er. But it was definitely in my top 10 for a couple years. 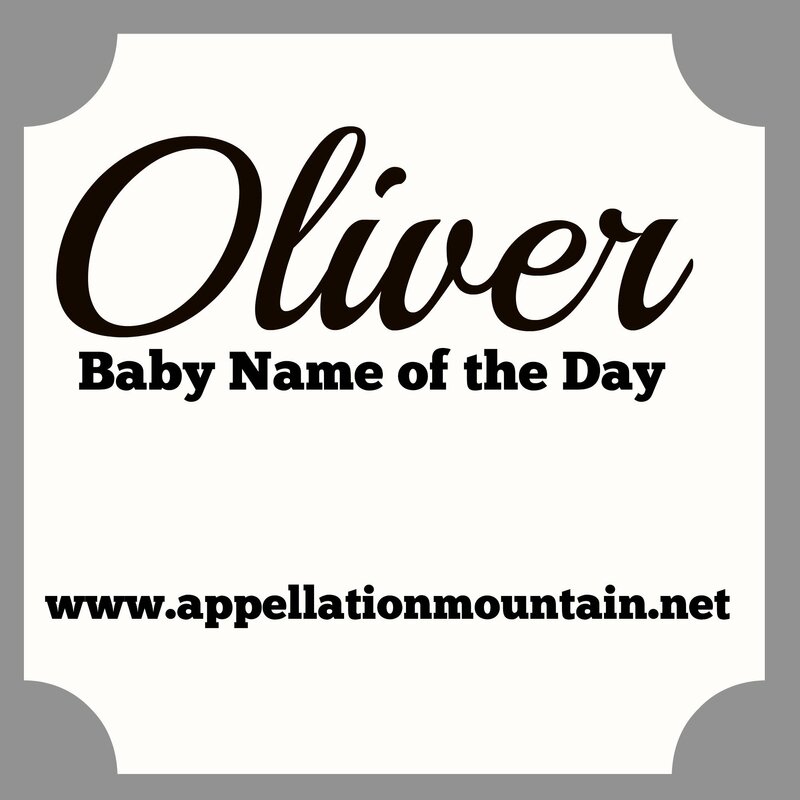 I’ve never met a little Oliver, though somehow it still sounds popular… probably because of Olivia. Oliver is ok, if a little boring. […] inking Toffee or Tippy on a daughter’s birth certificate. […] Orson was more common in the nineteenth century than today. […] but is actually relatively modern. […] for their sons, including Biblical choices and ancient names. […] Jules on Cougar Town, model-turned-journalist-turned-author Jules Asner and celeb chef Jamie Oliver’s wife (and partner in extreme baby-naming), Jools. […] Elea’s Siblings for Leonidas is the most recent installment. […] right at home with current favorites, for either gender.